These Paper Daffodils are a fun Spring or Easter Craft for Preschoolers on up! You can even take it a step further and put a bunch in a clay pot for a homemade centerpiece! 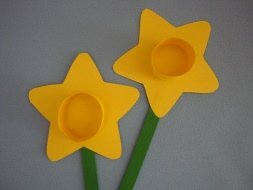 Preschoolers will need help cutting out the shapes, but they can paint and assemble their Daffodils all by themselves! 1. Paint your craft stick green. If you don't have time for "paint to dry" you can always color your stick with a green marker. 2. From the construction paper cut out a star shape and a rectangular strip (star shaped cookie cutters make great templates to trace around). 3. Roll your strip into a circle and secure with glue or tape. 4. Put glue on one end of your paper circle and attach it to your star. 5. Glue your craft stick to the star and you're all set! Take this craft even further by putting a piece of foam into a clay pot, covering the foam with Easter grass, and sticking all of your Daffodils into the pot. This would make a cute table centerpiece the kids can make for Spring or Easter!